I think that on the first screenshot the list items are to big and a lot of space is wasted. There are only three items visible (vlc, transmission, firefox). The app icons could be much smaller and application descriptions are unnecessary imo. There is a lot of blank space in every list item. Maybe a install/remove button could be placed under app icon? Dunno. I quite agree, and support greater information density here. You might also be interested in https://bugs.kde.org/show_bug.cgi?id=385973. I think it is really important for new users, to have a pleasent clean ui for the software installer they are relying on then. That is giving them confidence and make them trust in this new platform. Having something there that works out of the box as expected, is helpful, especiallially as a first impression. I think, that it needs these minor improvements that @drums already mentioned, when used on small laptop screens. Also, I personaly DON’T consider it as not intuitive and weird when looking at it, to present app metadata above the pictures. 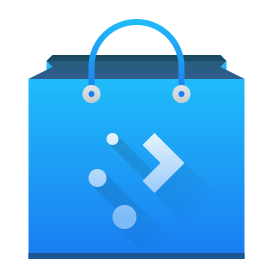 It is the way deepin-appstore ( https://www.deepin.org/en/original/deepin-appstore/) presents their apps, and I consider their solution in this special case as really beautiful. I don’t want to complain about anything , these are only my personal suggestions. But in general, when I look at it, discover seems to be on it’s way to get better and better. It’s so much better now, compared to how it looked/worked one_and_a_half_year_ago. In the app page, is there any reason to why the apps metadata is put above the pictures? It seems a little weird to me and would rather prefer if it was moved down below the app description, but above the reviews. Besides from this nitpicking Discover seems quite useful, good work! We thought it made the most sense there. 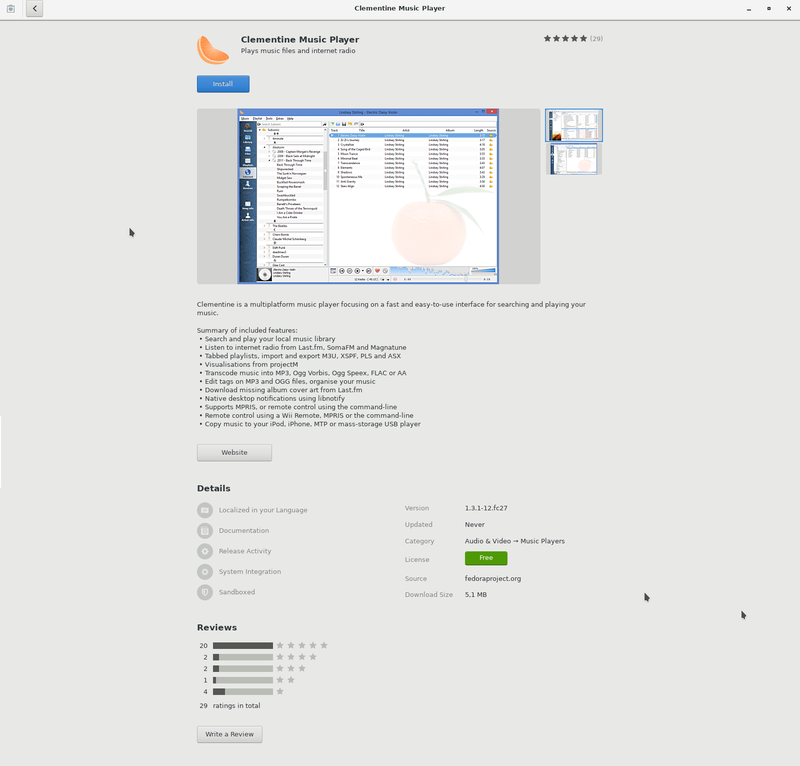 I do see that GNOME Software has the info on the bottom. The design is a work in progress, and we’re always happy to hear user feedback! I’m glad you’re finding Discover useful! It’s nice to see that Discover is getting more polished. 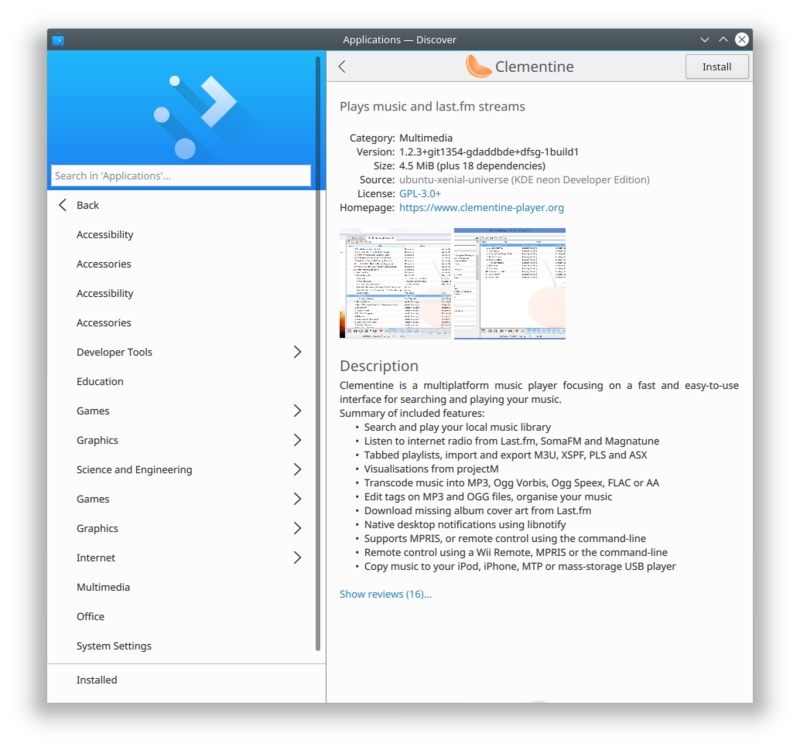 I think the way applications are presented in Gnome Software is pretty nice, with the info at the bottom, the labels being slightly muted, the license being interpreted as Free/Nonfree and the website being accessible via a button. Thank you for reporting the current state of Discover! Could you please mention the state of Snaps integration and whether their support is comparable to the flatpak’s one? I can remember Aleix and Harald were pushing that topic pretty much and with Bionic coming soon it’s a quite important one. Snap support is rougher than Flatpak, but advancing quickly. 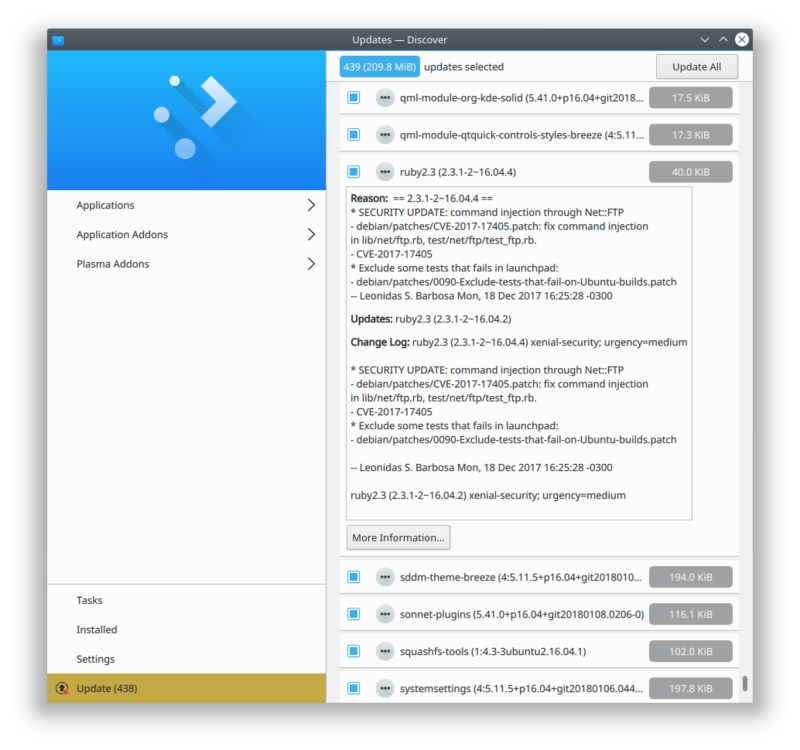 It’s already quite usable–if your distro packages the Discover Snap backend, which Kubuntu 17.10 doesn’t, oddly enough. As for reviews, I believe they are all shown. We don’t show a star rating, though. I like discover a lot, but i also liked the late Bodega’s concept of being a store for not just apps, but for everything (music, books, and so on). Any chance of this coming for Discover any time soon? This is a really cool idea, and we’re discussing it! I’m not him, but why can’t Qt apps ever have nice scrollbars that stay out of the way like Gnome apps? I love KDE software and Qt, but this is my biggest pain point. The scrollbars are always there and are enormous. With Gnome, the scrollbars disappear when no scrolling is taking place; if you scroll with the mouse wheel or by touch, the scrollbar shows up to indicate your position, but it’s very thin; the scrollbar only shows up at its full thickness if you actually mouse over it to grab it directly. 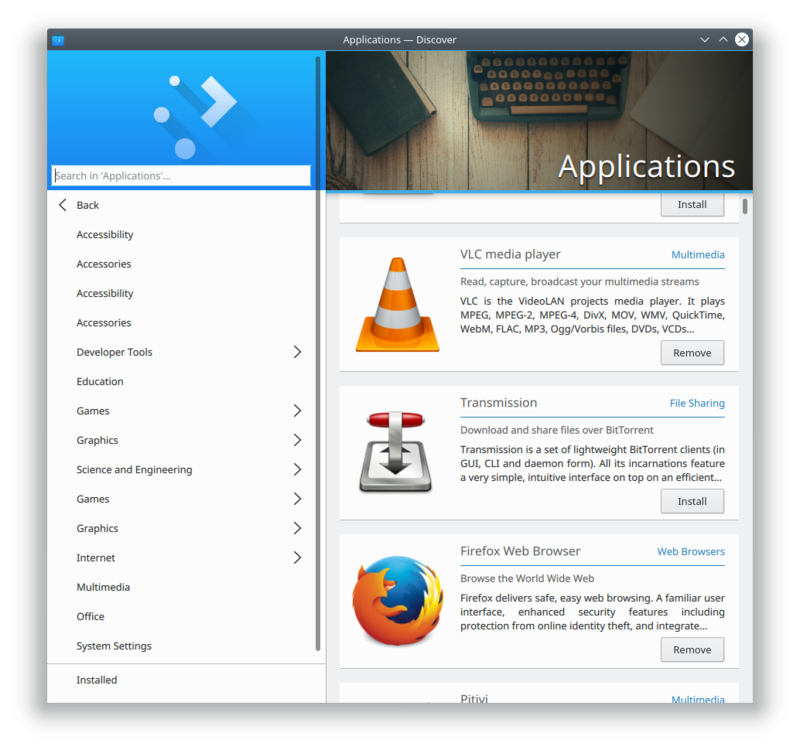 I’d love it if Qt / KDE apps worked like this. You might be interested in the proposed patch at https://phabricator.kde.org/D9792. which makes not-in-use scrollbars even thinner (they expand to full size when being used). We’ll definitely consider a global option to hide scrollbars when not in use, but since such a thing would be quite polarizing, we’d definitely make it an option, not something mandatory. This is how macOS handles it, for example. This is very exciting news to see all of the work going into discover. I have used discover in the past and I have not found it to be a satisfying experience. I mention it in the latest Destination Linux Podcast when we talked to Jonathan Riddell. Are all of the bugs listed above fixed and out now? or is there a date or version number that they will be out in? I can’t wait to try it out again. Thanks for all of the hard work you and everybody else put into this. I’m glad you like it! 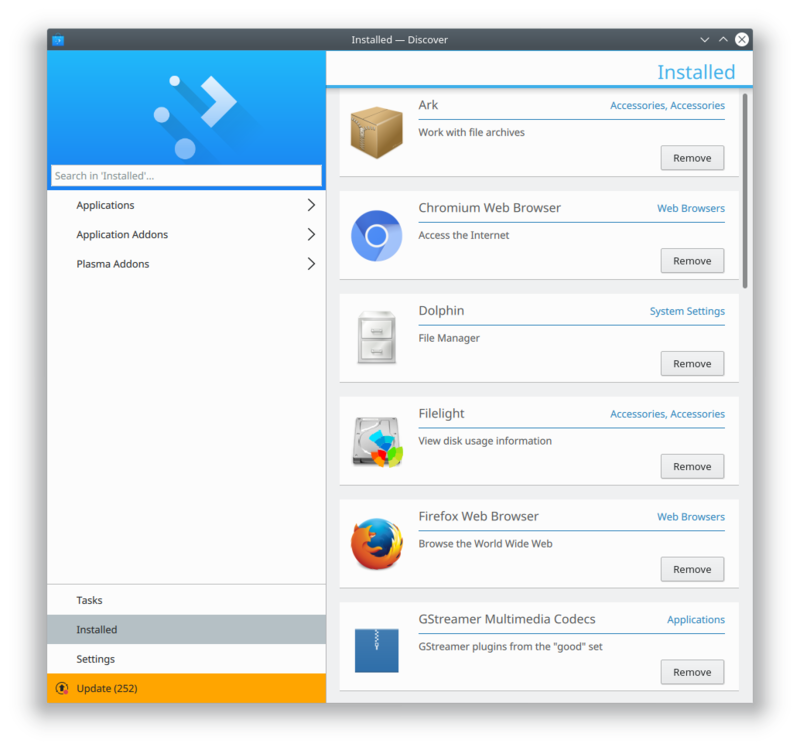 Discover is released as a part of KDE Plasma, so they should all be fixed in the next major Plasma version, which is 5.12. I never understood my discover makes so increadable bad use of the space. Not only that the left bar is quite to wide, the big blue section with the Plasma logo is just not necessary and useless, also the big picture above the application list … It may look fancy but it is just so huge … There would be room for at least one more app to be shown. Furthermore the application list itself is also to big (for my taste) I think discover is the reason why I don’t like Kirigami and how it looks like. But I don’t wan’t to complain. Should I make a mockup with tackles the point which disturbs me the most ? Not that it should be changed just for me (lol) but maybe I could help to improve some design details? First of all, when installing an application, it is impossible to see the installation percentage, is it a bug? And is it solved nowadays? Second: The integration with “Dark Breeze” has a problem; the titles are too dark, so they get mixed up with the background. Third (and finally): Application icons are pixelated, not when looking for an app, but when you open Discover. Thanks for reading! Congratulations for your job! I will be waiting for your answer! I just checked, already fixed! This is https://bugs.kde.org/show_bug.cgi?id=388253. We haven’t figured it out yet, but in KDE Neon, it only shows up in HiDPI mode, at least. We’re working on the issue. On your screenshot of Updates screen I found that you may see changelog of the packages to be updated. Don’t see it on the latest KDE Neon on my PC. I often see updates to the core apps like Dolphin, but can’t find out what’s new, because there’s no Changelog. It would be great to have one. That’s an issue in Neon. We can only display changelogs when the packages supply them.